A layout manager which arranges widgets horizontally or vertically. This layout manager arranges widgets horizontally or vertically inside the parent container. The space is divided so that each widget is given its preferred size, and remaining space is divided according to stretch factors among widgets. If not all widgets can be given their preferred size (there is not enough room), then widgets are given a smaller size (down to their minimum size). If necessary, the container (or parent layout) of this layout is resized to meet minimum size requirements. The preferred width or height of a widget is based on its natural size, where it presents its contents without overflowing. WWidget::resize() or (CSS width, height properties) can be used to adjust the preferred size of a widget. The minimum width or height of a widget is based on the minimum dimensions of the widget or the nested layout. The default minimum height or width for a widget is 0. It can be specified using WWidget::setMinimumSize() or using CSS min-width or min-height properties. When the container of a layout manager does not have a defined size (by having an explicit size, or by being inside a layout manager), or has has only a maximum size set using WWidget::setMaximumSize(), then the size of the container will be based on the preferred size of the contents, up to this maximum size, instead of the default behaviour of constraining the size of the children based on the size of the container. Note that because of the CSS defaults, a WContainer has by default no height, but inherits the width of its parent widget. The width is thus by default defined. A layout manager may provide resize handles between items which allow the user to change the automatic layout provided by the layout manager (see setResizable()). Each item is separated using a constant spacing, which defaults to 6 pixels, and can be changed using setSpacing(). In addition, when this layout is a top-level layout (i.e. is not nested inside another layout), a margin is set around the contents. This margin defaults to 9 pixels, and can be changed using setContentsMargins(). You can add more space between two widgets using addSpacing(). For each item a stretch factor may be defined, which controls how remaining space is used. Each item is stretched using the stretch factor to fill the remaining space. Enumeration of the direction in which widgets are layed out. Horizontal layout, widgets are arranged from left to right. Horizontal layout, widgets are arranged from right to left. Vertical layout, widgets are arranged from top to bottom. Vertical layout, widgets are arranged from bottom to top. Creates a new box layout. This constructor is rarely used. 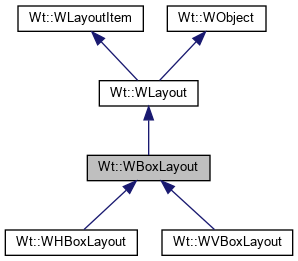 Instead, use the convenient constructors of the specialized WHBoxLayout or WVBoxLayout classes. Use parent = 0 to created a layout manager that can be nested inside other layout managers. Adds a nested layout to the layout. Adds a nested layout, with given stretch factor. Adds extra spacing to the layout. Adds a stretch element to the layout. This adds an empty space that stretches as needed. Adds a widget to the layout. Adds a widget to the layout, with given stretch factor. When the stretch factor is 0, the widget will not be resized by the layout manager (stretched to take excess space). The alignment parameter is a combination of a horizontal and/or a vertical AlignmentFlag OR'ed together. The alignment specifies the vertical and horizontal alignment of the item. The default value 0 indicates that the item is stretched to fill the entire column or row. The alignment can be specified as a logical combination of a horizontal alignment (Wt::AlignLeft, Wt::AlignCenter, or Wt::AlignRight) and a vertical alignment (Wt::AlignTop, Wt::AlignMiddle, or Wt::AlignBottom). Inserts a nested layout in the layout. Inserts a nested layout in the layout at positionindex, with given stretch factor. Inserts extra spacing in the layout. Inserts extra spacing in the layout at position index. Inserts a stretch element in the layout. Inserts a stretch element in the layout at position index. This adds an empty space that stretches as needed. Inserts a widget in the layout. Inserts a widget in the layout at position index, with given stretch factor. When the stretch factor is 0, the widget will not be resized by the layout manager (stretched to take excess space). Returns whether the user may drag a particular border. This method returns whether the border that separates item index from the next item may be resized by the user. Sets whether the use may drag a particular border. This method sets whether the border that separates item index from the next item may be resized by the user, depending on the value of enabled. If an initialSize is given (that is not WLength::Auto), then this size is used for the size of the item, overriding the size it would be given by the layout manager. Sets spacing between each item. The default spacing is 6 pixels. Sets the stretch factor for a nested layout. The layout must have previously been added to this layout using insertLayout() or addLayout(). Returns whether the stretch could be set. Sets the stretch factor for a widget. The widget must have previously been added to this layout using insertWidget() or addWidget(). Returns the spacing between each item.